‘I just LOVE it when a plan comes together’. I also love it when I can quote the A-team (and thereby date myself for those of you who think the A-team refers to the team that caters to Kim Kardashian’s ‘finer assets’). My e-design client was looking for a paint colour that would take inspiration from her bedding and add a cozy, personal vibe to her bedroom. And not only that, she was one of the BRAVE ones and was open to colours with a bit more depth and body – and those are RIGHT in my wheelhouse! Before, her bedroom was bright and had nice furniture and bedding, but the paint colour did NOTHING to set either of them off. After, I bet you didn’t even NOTICE before that she had a tray ceiling or the beautiful cherry tone of her furniture! Based on her photos and the answers to the questionnaire, I came up with 3 paint colours for her to peruse. After sampling, she decided upon Sherwin Williams Moody Blue – and Moody Judy it is! I just love this next shot. I am ALWAYS grateful to my clients and the ‘after’ photos that they send from across the country – if you’ve ever tried to take interior photos, you know how hard it can be! This next photo really shows how this beautiful blue/green blend can lean slightly more to the blue side in the right lighting! Are you looking for the PERFECT paint colour for your home? Check out my affordable Edesign and Paint Colour Consulting! That is absolutely breathtaking! 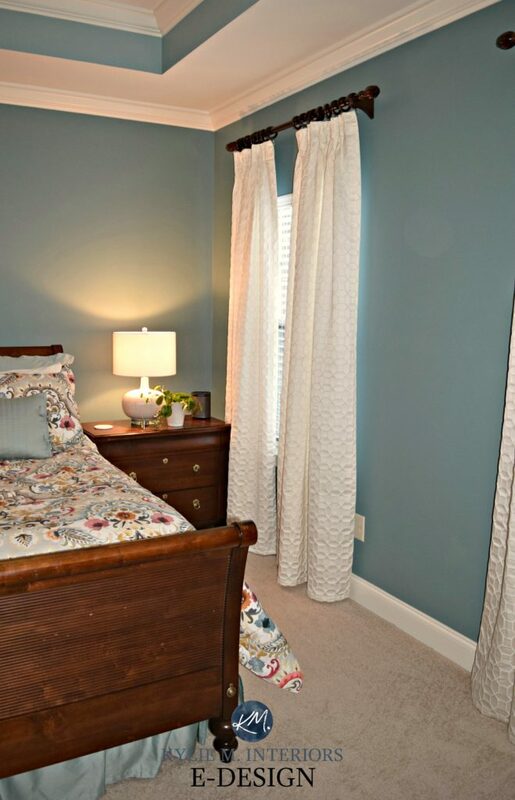 The color makes all the difference and is beautiful with the bedding and furniture. Great job Kylie! Wow, what a statement with that color! I love it! This color is drop dead gorgeous!! I’m going to consider it for my bedroom too. It is cool and refreshing and at the same time, warm and soothing. It sets off the beautiful bedding and furniture in such an elegant way. Great job, Kylie. Your skills are top notch! Now the big question is, does this room pair well with red wine or white wine??? Thank you so much for sharing your talents with us “wanna be designers .” Love your blog.! Wow! That is an amazing transformation! Perfection! What a difference! And no, I didn’t notice the beautiful ceiling in the first shot. I love that colour. I’ve made a promise to myself to “GO BOLD” with my decor and color decisions as I go through my new home, personalizing and freshening up each each room. Goodbye Builder Beige and Hello Storm Gray, Teal, Orange, and who knows what else! I appreciate all the inspiration that you share on your blog and I feel completely empowered with my recent knowledge about what that LRV number means on my paint chips! I’m learning to go with my heart and to trust my instincts (armed with lots of design knowledge from your blog and other sources), and I’m usually rewarded with great results! WAhoo, well that is an AWESOME AWESOME comment to get – I’m so excited! I love it when clients embrace their tastes and run with it – you can SO do it! Stunning. Amazing what the right color paint can do to a room. She did very well on the before and after photos. Thanks Jill Marie, she did an AWESOME job – they are so hard to do! Impressive! The color makes the room! Love it! That paint color makes that wood sing! I enjoy reading your posts but have never posted–this time I’m compelled to say that you truly are great at what you do. WOW!!! Hi Cindy, thank you so much! Beautiful!! Love it! So excited to get my color consult back from you!! Wow! How to change the look of a room without changing the existing furniture or bedding. A totally different look for minimal expense. Fabulous. Awesome!!! Love she used both colors. The bedding and cherry furniture are beautiful. She has good taste. But possibly hit a roadblock on wall color. A quick question … would you happen to know the color of “white” on the doors, trim and ceiling that was used? and what are your thoughts on “when” or “if” a ceiling should be painted a color other than ceiling white?, just curious about your take on ceiling treatment . I am loving my bedroom and am so very happy with the color! Thanks again, Kylie! The trim/door color is SW Creamy and the ceiling is SW Shell White. Great “eye” Kylie–the room looks just gorgeous now! 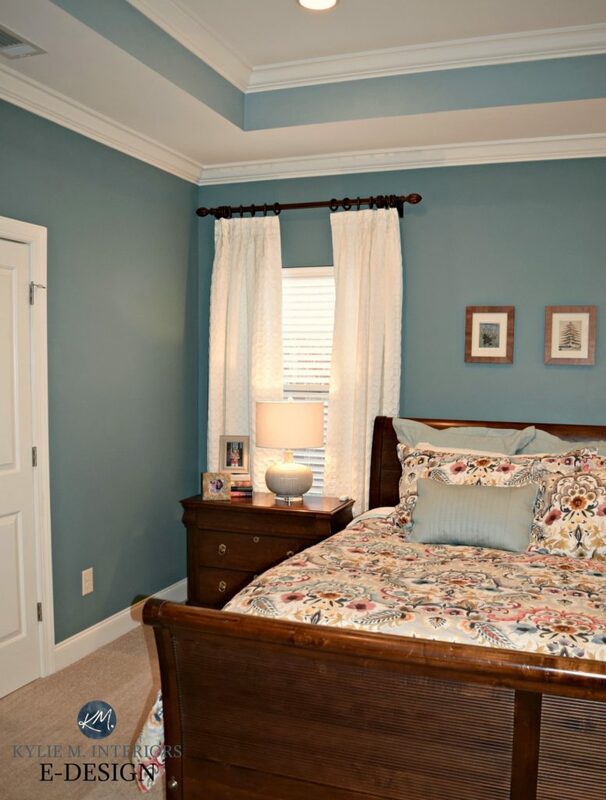 I am curious, though, if the color that the client eventually went ,Moody Bllue, was the one on the left or right (where where she painted samples of them on the wall behind her bed.) It is hard to tell and I am wondering if a dark color like that looks lighter or darker when it is all over the wall. Also, I would never have guessed that the color of the trim was “creamy”–it looks so white (and the perfect “white–neither too bright and cold or too warm”, next to the teal! This is changing my mind about wanting a very pale color in my bedroom as I have cherry furniture, too! Thanks for your informative posts, as always. Great paint refresh of master bedroom! Looks so nice. As a lover of teal, I LOVE this color on the wall. Gorgeous. Beautiful!!! I’ve been debating on what teal/blue to use! This helps a bunch! Can you tell me what the shade is on the right? Is it SW Mediterranean? Great job on the room! I love the ceiling! Hi Bonnie, I’m sorry, I don’t remember what the other choice was! I give 3 options, so she’d narrowed it down to those 2! I love this. Does anyone know where the comforter set came from? Goes great with the paint choice.